We ran into enough issues to make a post out of those items. On the parquet side, I became familiar with the parquet file format and the partitioned nature of data storage within distributed computing platforms (in this case, I used Spark). I saw that the fastparquet library allowed me to read in partitioned .parquet files in aggregate, and convert that to a single Pandas dataframe. I decided to stray away from Spark and venture into single-node Python / Pandas because I couldn’t find any visualization packages within the Spark ecosystem, and only looking at lat / longs didn’t actually require much memory or compute power because we could throw away the rest of the data. I didn’t go into too much detail here last post, I kinda just did it, but I think the following code requires a bit of explaining at least. Seems reasonable, right? After all, this is what we’ve been doing so far within our other projects and posts. The problem is that datashader (being relatively new) is not yet on the pypi repository which pip points to. From my understanding, this takes a bit of work for the datashader folks because datashader relies on packages which are not purely python. In comes conda. The difference between pip and conda is that pip only manages python-related packages, while conda is not restricted like this. When we download the Anaconda distribution of python, we aren’t only getting python, we get a slew of other tools like R and Jupyter. These tools are not python-centric obviously, with R being a completely separate language and environment altogether. Datashader apparently requires packages which are not in the python environment specifically, so the only way to install datashader currently is to do it through conda. Note that there exists an anaconda3 folder as well because the Amazon Deep Learning AMI comes with both the python 2 and python 3 versions of the Anaconda distribution, with Jupyter connected to both. 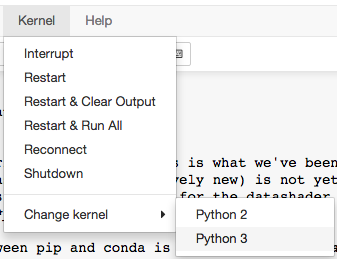 Just like there is a pip for python 2 and pip3 for python 3, there exists multiple conda prompts for each environment. When I tried to used the python 2 conda to install datashader, my python 2 environment wouldn’t recognize the package. It kept saying datashader module is not found. Datashader provides instructions on how to install from source with pip, so I did that instead. I had to install an additional library as well (dask[complete]) to make datashader work once and for all. Hope this all makes sense, and is not too convoluted! Let’s continue with our datashader deep dive. I will pretty much be following this datashader notebook on US census data because it is exactly what I want to do. Let’s load the data again using fastparquet. I’ll believe em because their census maps look breathtaking. Let’s plot the lat long. According to datashader, what we’ve done above is convert our actual points into a aggregated grid per pixel. In this step, every data point is iterated through and visualizations going forward will depend on this grid. Apparently visualizations using this grid should be instantaneous because there are far fewer pixels than actual data points. Similar to to the census tutorial… we get almost nothing with some bright spots that I can’t even make out the location. What we’re seeing here is undersampling. Unfortunately the densities every where else other than the bright spots are so close to 0 relative to the peaks that it looks like there is no data there. The next thing the census tutorial does it put a floor of 20% of the full, saturated value. Let’s say the range of values that any pixel can take is , with being completely black (same as background) and being completely white (or grey, in the case of this color gradient we’re currently using). Putting a floor of 20% of the full value means that, now, the gradient will range from . This should prevent undersampling by forcing low values to take on some type of color. The problem is that of the available intensity scale in this gray colormap, nearly all pixels are colored the same low-end gray value, with only a few urban areas using any other colors. Thus this version of the map conveys very little information as well. Because the data are clearly distributed so non-uniformly, let’s instead try a nonlinear mapping from population counts into the colormap. A logarithmic mapping is often a good choice. Worryingly, though, the choice of ‘log’ was purely arbitrary, basically just a hunch based on how many datasets behave. One could easily imagine that other nonlinear functions would show other interesting patterns, or that different functions would be needed for different datasets. Oh man, that’s looking really good. Datashader itself has color maps too. Because we’re using a histogram equalization method at this point, I’m actually not so sure we need that 0.2 floor anymore… let’s try it without. The last thing the census tutorial does before getting into categorical data is highlight the top 1% of population density areas. We can do the same thing here, showing top 1% of areas with offenses by highlighting them red. This is interesting how datashader does this. Since we are using histogram equalization, we’re forcing every possible value in the color map to take on an equal amount of data samples. Above, we created a color gradient with 100 possible colors. We’ve forced the black to white gradient ( ) onto the first 99 elements of the final color gradient, and we add the color red to the 100th element of the color gradient. In essence, the first 99% of the data will be represented by the black to white gradient, and last 1% of data will be represented by red. Let’s see what happens with the top 5%. It becomes so clear where highly dense crime areas are! Manhattan takes the cake for sure, and the Bronx is not too far behind. We see quite a bit in Brooklyn as well, but not as much. We have random pockets here and there, which may be attributed to certain neighbourhoods or landmarks. That’s probably enough for this post. Let’s dive into categorical mapping in the next post.